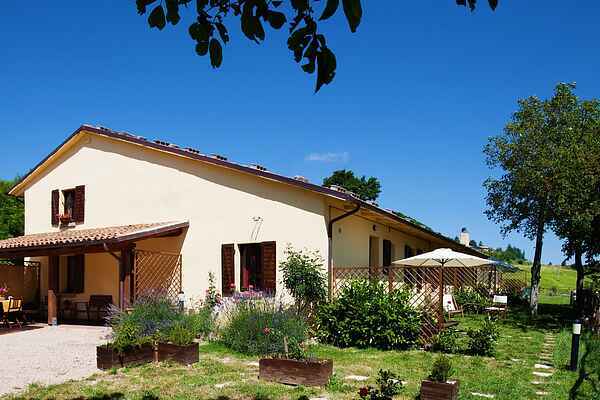 This agriturismo with 4 apartments is situated on a hill near the town of Cagli, a little higher than the town itself. The area is surrounded by woods, hills and the magnificent mountain tops of Monte Catria, Nerone and Petrano. This is an ideal location if you're looking for relaxation and tranquillity in a natural area that's perfect for hikes. The apartment has a charming, cosy interior full of warm colours. Each apartment has a private terrace. The agriturismo features a swimming pool with a 360-degree panoramic view of the valley. The area is known for its truffles. You can go foraging for truffles and mushrooms. Conveniently situated, these apartments allow you to visit sights like Urbino, Gubbio, Fano and Fossombrone. This agriturismo offers a quiet holiday in a gorgeous area with breathtaking views.